Icard Merrill’s skilled governmental law litigators have extensive experience in handling a wide and varied range of state and local government and administrative law disputes. Our unique experience and perspective come from a history of representing governmental entities and agencies, as well as assisting businesses or individuals pursuing or defending matters before these respective governmental bodies. Along with this experience and perspective, our government law litigators offer innovative approaches to successfully resolve our clients’ specific governmental law needs. 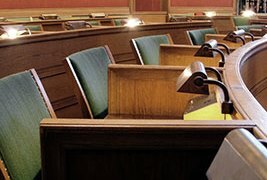 At all levels of the litigation process – from pre-trial through post-trial and appeal – our litigators have the comprehensive familiarity of government and administrative substantive and procedural law, as well as the accomplished courtroom skill that provides our clients with the valuable representation they need. Our administrative law litigation group also collaborates closely with other departments in the firm, including land use, real estate, and others, to ensure that all of our government law clients’ legal concerns are addressed.